Although we usually think of work as paid, unpaid work is equally important to the economy. An hourly worker is an employee paid an hourly wage for their services, as opposed to a fixed salary. A salary is a form of periodic payment from an employer to an employee, which may be specified in an employment contract. Unpaid workers work without pay. An internship is a system of on-the-job training for white-collar and professional careers. Although interns are typically college or university students, they can also be high school students or post-graduate adults. Unpaid work includes work done by family members to maintain a household. This work is usually done by women, and includes tasks such as cooking, cleaning, and rearing children. Most of the time when we think of work, we think of paid work. Workers may be paid in a variety of ways, most commonly hourly wages or salaries. An hourly worker is an employee paid an hourly wage for their services, as opposed to a fixed salary. Hourly workers may often be found in service and manufacturing occupations, but are common across a variety of fields. A salary is a form of periodic payment from an employer to an employee, which may be specified in an employment contract. Many types of work, however, are unpaid. Unpaid workers work without pay. These may be members of a family or cooperative; conscripts or forced labor; volunteer workers who work for charity or amusement; students who take intern positions as work experience; or conventional workers who are not paid because their enterprise is short of money. Internships are a common type of unpaid work. An internship is a system of on-the-job training for white-collar and professional careers. Internships for professional careers are similar to apprenticeships for trade and vocational jobs. Although interns are typically college or university students, they can also be high school students or post-graduate adults. Generally, the internship is an exchange of services for experience between the student and his or her employer. Students exchange their cheap or free labor to gain experience in a particular field. They can also use an internship to determine if they have an interest in a particular career, create a network of contacts, or gain school credit. Some interns also find permanent, paid employment with the companies in which they interned. Thus, employers also benefit, as experienced interns need little or no training when they begin full-time, regular employment. Another important type of unpaid work is work done by family members to maintain a household. Unpaid domestic work has traditionally been done by women (e.g., wives and mothers). Their work may include cooking, cleaning, rearing children, or managing household expenses. As more women enter the paid workforce, many find themselves returning home after a day of paid work to continue working a “second shift” of unpaid domestic work. Though unpaid, this domestic work is crucial to the economy: it keeps workers alive and healthy and helps raise new generations of workers to keep the paid economy running. Division of labor is the specialization of cooperative labor in specific, circumscribed tasks and roles. A more complex division of labor is closely associated with the growth of economic output and trade, the rise of capitalism, and the complexity of industrialization processes. In a division of labor, the production process is broken down into a sequence of stages, and workers are assigned to particular stages. Increasing the specialization of work might lead to workers with low overall skills and a lack of enthusiasm for their work. Karl Marx described the process of alienation as follows. In his view, workers would become more and more specialized, and work would become more and more repetitive, until eventually the workers would be completely alienated from the process of production. In a division of labor, the production process is broken down into a sequence of stages, and workers are assigned to particular stages. Cooperative labor is specialized into specific, circumscribed tasks, which individuals in specific roles accomplish. Historically, as societies have developed more and more complex divisions of labors, the economies of those societies has grown proportionately, both in trade output and living standards. A complex division of labor appears to be strongly correlated with the rise of capitalism, as well as the rise of complex industrial production. While it can have benefits for productivity, the specialization of labor can lead to workers with low overall skills and low enthusiasm. This viewpoint was extended and refined by Karl Marx. He described the process of specialization as alienation. In his view, workers become more and more specialized, and their work becomes more and more repetitive, until eventually they are completely alienated from the production process. He believed people could only be liberated if they were involved in the full scope of economic production, and he considered the strict division of labor only a temporary, necessary evil. In the modern world, those who think most about the division of labor are involved in the fields of management and organization. Now that labor has been specialized not just nationally but globally, people often wonder what type of division of labor would be the most beautiful, fair, ideal, and efficient. It is widely accepted that the division of labor is to a great extent inevitable, simply because no one person can do every task at once. Labor hierarchy is a very common feature of the modern workplace structure, but of course, the way these hierarchies are structured can be influenced by a variety of factors. The issue reaches its broadest scope in conversations about globalization, which is often euphemistically defined as the expansion of world trade based on comparative advantage. Theoretically, in an era of globalization, countries specialize in the work they can do at the lowest opportunity cost. Critics however allege that international specialization cannot be explained sufficiently in terms of “the work nations do best. ” Instead, critics think this specialization is guided more by commercial criteria, which favor some countries over others. 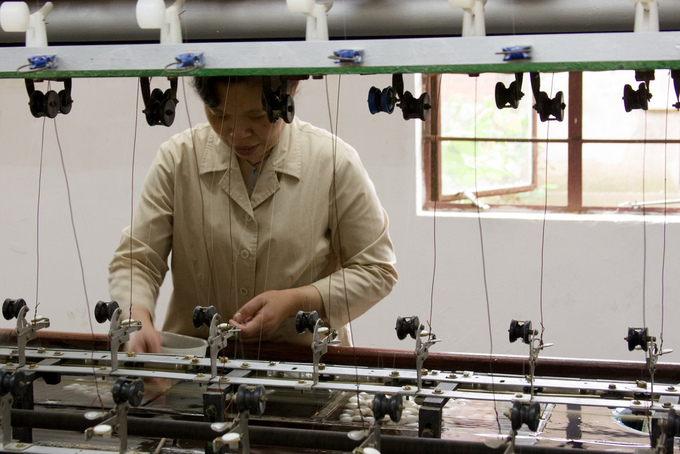 Division of Labor: A highly specialized division of labor is often used in factories, such as this Chinese silk factory. Industrial labor is labor in industry, usually manufacturing, but it may also include service work, such as cleaning or cooking. Before the Industrial Revolution, most production took place in homes or in small workshops. After the Industrial Revolution, production increasingly took place in factories, giving rise to industrial labor. A blue-collar worker is a member of the working class who performs manual labor. Karl Marx used the term proletariat to describe the industrial working class. Industrial labor: Industrial labor is labor in industry, mostly understood as manufacturing, but can include related service workers, such as cleaners and cooks. blue-collar worker: A blue-collar worker is a member of the working class who performs manual labor. In the 18th and 19th centuries, the Industrial Revolution dramatically changed labor practices. New technology made workers much more efficient and productive, but these developments were expensive. Building new industrial machines required enormous investments. To be able to afford these investments, production had to take place on a larger scale. Before the Industrial Revolution, most production took place in homes or in small workshops. After the Industrial Revolution, production increasingly took place in factories, many of which were situated together in industrial districts. Industrial labor is defined as labor in industry. In most cases, this is understood as manufacturing, the type of labor that takes place in factories, on assembly lines, and that which involves heavy machinery. This being said, industrial labor also includes service jobs that rose up alongside, and as a result of, industrial production. Industrial labor includes factory workers, but it may also include service workers, such as cleaners and cooks. Karl Marx referred to industrial laborers as members of the proletariat. In common parlance, these people are often referred to as blue-collar workers. Blue-collar work may be skilled or unskilled, and includes manufacturing, mining, construction, mechanics, maintenance, technical installation, and other types of physical work. Often, blue-collar workers physically build or maintain something. The New Blue-Collar Worker: This clip from CNN shows the development of a new type of blue-collar worker in South Carolina. The term “blue collar” refers to the type of clothing often worn by industrial workers. Industrial and manual workers often wear durable canvas or cotton clothing that may be soiled during the course of their work. Navy and light blue colors conceal potential dirt or grease on workers’ clothing, helping them appear cleaner. For the same reason, blue is a popular color for overalls. Some blue-collar workers have uniforms embroidered with either the business’ name or the individual’s name. Alienation occurs when the worker can only express individuality through a production system that is not collectively, but privately owned. Marx’s theory of alienation refers to the separation of things that naturally belong together, or to putting antagonism between things that are properly in harmony. Marx’s theory is founded upon his observation that, within the capitalist mode of production, workers invariably lose determination of their lives and destinies by being deprived of the right to conceive of themselves as the director of their actions. Alienation refers to the social alienation of people from aspects of their “human nature. ” Marx believed that alienation is a systematic result of capitalism. Workers are alienated by the bourgeoisie, who own the means of production. capitalist mode of production: In Marx’s critique of political economy, the capitalist mode of production is the production system of capitalist societies, which began in Europe in the 16th century, grew rapidly in Western Europe from the end of the 18th century, and later extended to most of the world. It is characterized by: the predominance of private ownership of the means of production and exploitation of wage labor, distribution and exchange in a mainly market economy (commodity production), and capital accumulation (production for profit). human nature: The fundamental set of qualities, and the range of behavior, shared by all humans. The theory of alienation, as expressed in the writings of Karl Marx, refers to the separation of things that naturally belong together, or to put antagonism between things that are properly in harmony. In the concept’s most important use, it refers to the social alienation of people from aspects of their “human nature. ” Marx believed that alienation is a systematic result of capitalism. Marx’s theory of alienation is founded upon his observation that, within the capitalist mode of production, workers invariably lose determination of their lives and destinies by being deprived of the right to conceive of themselves as the director of their actions, to determine the character of their actions, to define their relationship to other actors, and to use or own the value of what is produced by their actions. Workers become autonomous, self-realized human beings, but are directed and diverted into goals and activities dictated by the bourgeoisie, who own the means of production in order to extract from workers the maximal amount of surplus value possible within the current state of competition between industrialists. By working, each contributes to the common wealth. Alienation in capitalist societies occurs because the worker can only express this fundamentally social aspect of individuality through a production system that is not collectively owned, but privately owned. Karl Marx: Conflict theory derives from the ideas of Karl Marx. In the “Economic and Philosophical Manuscripts of 1844,” Marx identifies four types of alienation in labor under capitalism. The first is the alienation of the worker from the work he produced, or from the product of his labor. The product’s design and the manner in which it is produced are determined not by its actual producers, nor even by those who consume products, but rather by the capitalist class. This capitalist class appropriates labor, including that of designers and engineers, and seeks to shape the tastes of consumers in order to maximize profit. The second is the alienation of the worker from working, or from the act of producing itself. This kind of alienation refers to the patterning of work in the capitalist mode of production into an endless sequence of discrete, repetitive, trivial, and meaningless motions, offering little, if any, intrinsic satisfaction. The third is the alienation of the worker from himself as a producer, or from his or her ” species being ” or “essence as a species. ” To Marx, this human essence was not separate from activity or work, nor static, but includes the innate potential to develop as a human organism. Species being is a concept that Marx deploys to refer to what he sees as the original or intrinsic essence of the species, which is characterized both by plurality and dynamism: all beings possess the tendency and desire to engage in multiple activities to promote their mutual survival, comfort, and sense of interconnection. The fourth is the alienation of the worker from other workers, in which the capitalist system reduces the act of work to a simple economic practice, rather than recognizing the social elements of the act of production. A capitalist system sees the labor of the worker to a commercial commodity that can be traded in the competitive labor-market. It does not view labor as a constructive socioeconomic activity that is part of the collective common effort performed for personal survival and the betterment of society. When the bourgeoisie interferes with or impedes any of these natural tendencies, the worker is alienated. Industrial sociology examines the effects of industrial organization on workers, and the conflicts that can result. Industrial sociology examines the effects of labor markets, work organization and management on societal inequality and “the ways in which workers challenge, resist, and make their own contributions to the patterning of work and shaping of work institutions”. In his Labor Process Theory, Sociologist Harry Braverman argued that capitalist managers were incessantly driven to deskill the labor force to lower production costs and ensure higher productivity. A labor union is an organization of workers who have banded together to achieve common goals such as higher pay, increasing the number of employees an employer hires, and better working conditions. Social unionism encompasses many unions that use their organizational strength to advocate for social policies and legislation favorable to their members or to workers in general. 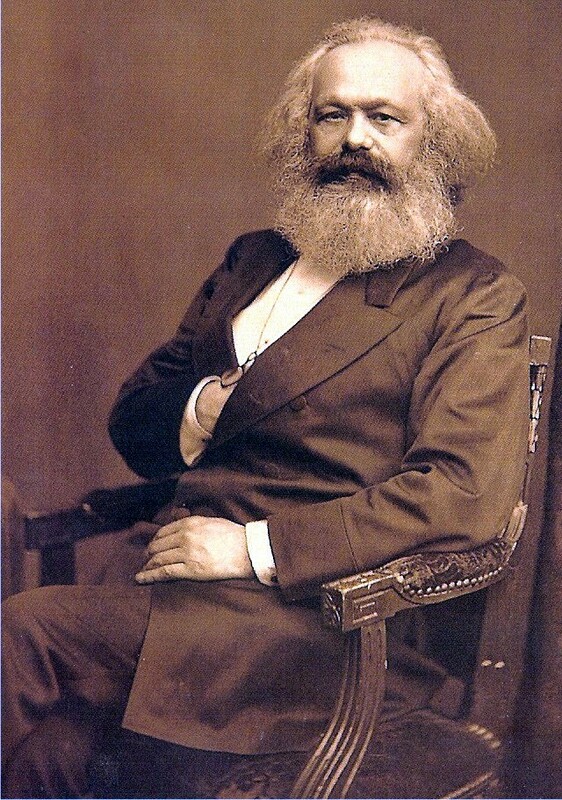 Marxist: Following the ideals of Karl Marx, including that of egalitarian communism. deskill: To redesign (a job) so that less skill is required to carry it out, for example through the introduction of new technology. Industrial sociology examines the effects of labor markets, work organization, employment relations, managerial approaches, and other factors of inequality in society, and “the ways in which workers challenge, resist, and make their own contributions to the patterning of work and shaping of work institutions” (Watson, 2008). One branch of industrial sociology is labor process theory (LPT). In 1974, Harry Braverman wrote Labor and Monopoly Capital: The Degradation of Work in the Twentieth Century, which provided a critical analysis of scientific management. This book analyzed capitalist productive relations from a Marxist perspective. Following Marx, Braverman argued that work within capitalist organizations was exploitative and alienating, and therefore workers had to be coerced into servitude. For Braverman, the pursuit of capitalist interests over time ultimately leads to the deskilling and routinization of the worker. Braverman demonstrated several mechanisms of control in both the factory blue collar and clerical white collar labor force. His key contribution is his “deskilling” thesis. Braverman argued that capitalist owners and managers were incessantly driven to deskill the labor force to lower production costs and ensure higher productivity. Deskilled labor is cheap and above all easy to control due to the workers lack of direct engagement in the production process. In turn, work becomes intellectually or emotionally unfulfilling. The lack of capitalist reliance on human skill reduces the need of employers to reward workers in anything but a minimal economic way. A labor or trade union is an organization of workers that have banded together to achieve common goals such as higher pay, increasing the number employees an employer hires, and better working conditions. Originating in Europe, trade unions became popular in many countries during the Industrial Revolution, when the lack of skill necessary to perform most jobs shifted employment bargaining power almost completely to the employers’ side, causing many workers to be mistreated and underpaid. Trade union organizations may be composed of individual workers, professionals, past workers, students, apprentices and/or the unemployed. 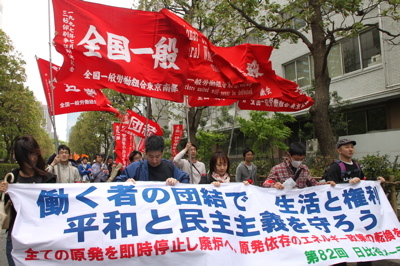 Trade Union in Japan: The Nambu University Teachers Union members picket on May Day 2011. In contrast, craft unionism organizes workers along lines of their specific trades (i.e., workers using the same kind of tools, or doing the same kind of work with approximately the same level of skill), even if this leads to multiple union locals with different contracts in the same workplace. In addition to advocating for worker rights, unions may also engage in broader political or social struggle. Social unionism encompasses many unions that use their organizational strength to advocate for social policies and legislation favorable to their members or to workers in general. In some countries, unions are closely aligned with political parties. Labor unions provide members with the power of collective bargaining over and fight for workers rights. Labor unions are legally recognized as representatives of workers in many industries in the United States. Their activity today centers on collective bargaining over wages, benefits, and working conditions for their membership, and on representing their members in disputes with management over violations of contract provisions. Most unions in America are aligned with one of two larger umbrella organizations: the AFL-CIO and the Change to Win Federation. Union membership has been declining in the U.S. since 1954. To fight employer anti-union programs, unions are currently advocating new “card check” federal legislation that would require employers to bargain with a union if more than 50% of workers signed forms, or “cards,” stating they wish to be represented by that union. “card check”: Card check (also called majority sign-up) is a method for American employees to organize into a labor union in which a majority of employees in a bargaining unit sign authorization forms, or “cards,” stating they wish to be represented by the union. Labor unions are legally recognized as representatives of workers in many industries in the United States. Labor union’s activism centers on collective bargaining over wages, benefits, and working conditions for their membership, and on representing their members in disputes with management over violations of contract provisions. Most unions in America are aligned with one of two larger umbrella organizations: the AFL-CIO created in 1955, and the Change to Win Federation, which split from the AFL-CIO in 2005. Both advocate policies and legislation on behalf of workers in the United States and Canada, and take an active role in politics. The AFL-CIO is especially concerned with global trade issues. 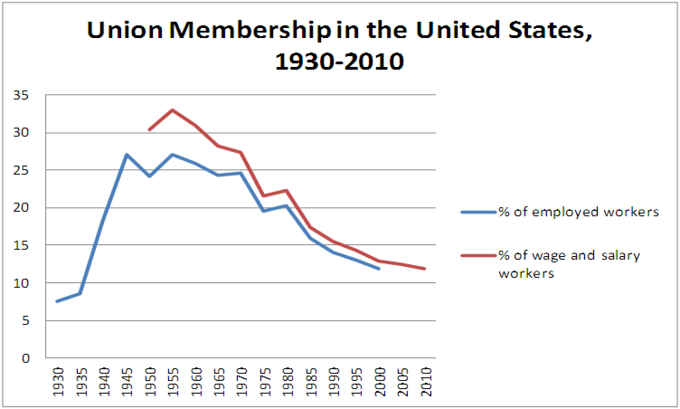 Union membership had been declining in the US since 1954. In 2007, the Labor Department reported the first increase in union memberships in 25 years and the largest increase since 1979. Most of the recent gains in union membership have been in the service sector while the number of unionized employees in the manufacturing sector has declined. Although most industrialized countries have seen a drop in unionization rates, the drop in union density (the unionized proportion of the working population) has been more significant in the United States than elsewhere. Dropping unionization rates cannot be attributed entirely to changing market structures; scholars have shown the tremendous complexity inherent in explaining the decline of union density. Although much smaller compared to their peak membership in the 1950s, American unions remain an important political factor, both through mobilization of their own memberships and through coalitions with like-minded activist organizations around issues such as immigrant rights, trade policy, health care, and living wage campaigns. To fight employer anti-union programs, unions are currently advocating new “card check” federal legislation that would require employers to bargain with a union if more than 50% of workers signed forms, or “cards,” stating they wish to be represented by that union, rather than waiting 45 to 90 days for a federally-supervised a secret ballot election during which time employers can fire, harass and generally make life miserable for pro-union employees. Union Membership in the United States: This diagram shows the rise and fall of union membership in the United States. The Information Age has impacted the workforce through automation and computerization, resulting in higher productivity and fewer jobs. Knowledge workers are workers whose main capital is knowledge. Typical examples of knowledge workers may include software engineers, architects, engineers, scientists, and lawyers, because they “think for a living”. In the Information Age, workers are being replaced by computers that can do the job more effectively and faster. Automation is the use of control systems and information technologies to reduce the need for human work in the production of goods and services. The service sector consists of the “soft” parts of the economy, where the production of services is valued instead of end products. service sector: The tertiary sector of the economy (also known as the service sector or the service industry) is one of the three economic sectors, the others being the secondary sector (approximately the same as manufacturing) and the primary sector (agriculture, fishing, and extraction such as mining). knowledge worker: Someone who works with information or data. The Information Age has impacted the workforce in several ways. It has created a situation in which workers who perform easily automated tasks are being forced to find work that is less automated. They are being forced to compete in a global job market, they are being replaced by computers that can do jobs more effectively and faster. This poses problems for workers in industrial societies. There is another way in which the Information Age has impacted the workforce: automation and computerization have resulted in higher productivity coupled with net job loss. Automation is the use of control systems and information technologies to reduce the need for human work in the production of goods and services. In the scope of industrialization, automation is a step beyond mechanization. Whereas mechanization provides human operators with machinery to assist them with the muscular requirements of work, automation greatly decreases the need for human sensory and mental requirements as well. 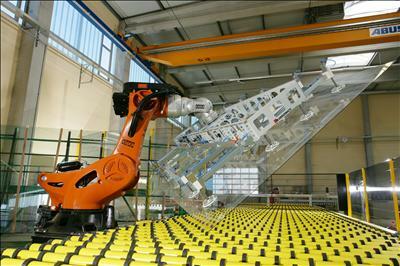 Automation plays an increasingly important role in the world economy and in daily experience. Automation: Automation is one of the ways in which the modern technology has impacted the workplace. Automation has had a notable impact in a wide range of industries beyond manufacturing. For example, telephone operators have been replaced largely by automated telephone switchboards and answering machines. Medical processes such as primary screening in electrocardiography or radiography and laboratory analysis of human genes, sera, cells, and tissues are carried out at much greater speed and accuracy by automated systems. Automated teller machines have reduced the need for bank visits to obtain cash and carry out transactions. In general, automation has been responsible for the shift in the world economy from industrial jobs to service jobs in the 20th and 21st centuries. Economic sociology is the study of the social causes and social effects of various economic phenomena. Economic sociology is the study of the social causes and social effects of various economic phenomena. This is distinguishable from the field of socioeconomics, which focuses on the social impact of very specific economic changes. Many classical sociologists, from Émile Durkheim to Georg Simmel, include economic analyses in their texts. Max Weber ‘s book The Protestant Ethic and the Spirit of Capitalism is the archetypical representation of the works of economic sociology’s classical period. Contemporary economic sociology emphasizes the social consequences of economic exchanges, the social meanings they involve, and the social interactions that they facilitate or obstruct. Some economic sociologists provide a social explanation to questions traditionally addressed by economists. However, other contemporary economic sociologists have forged different research programs based on new questions and new methods. economic sociology: Economic sociology studies both the social effects and the social causes of various economic phenomena. The Protestant Ethic and the Spirit of Capitalism: The Protestant Ethic and the Spirit of Capitalism is a book written by Max Weber, a German sociologist, economist, and politician. Begun as a series of essays, the original German text was composed in 1904 and 1905, and was translated into English for the first time by Talcott Parsons in 1930. It is considered a founding text in economic sociology and sociology in general. Economic sociology is the study of the social causes and social effects of various economic phenomena. This is distinguishable from the field of socioeconomics, which focuses on the social impact of very specific economic changes, such as the closing of a factory, market manipulation, or new policies that impact the economy of a very specific locale or population. The field of economic sociology can be broadly divided into a classical period and a contemporary period. Sociology came of age in the late nineteenth century, at the same time as capitalism and modernity were taking root. The classical period was concerned particularly with modernity and its phenomenological progeny, such as rationalization, secularization, urbanization, and social stratification. Thus, many classical sociologists, from Émile Durkheim to Georg Simmel, include economic analyses in their texts. Max Weber’s book The Protestant Ethic and the Spirit of Capitalism is the archetypical representation of the works of economic sociology’s classical period. Published in 1905, Weber argues that capitalism flourished in northern Europe because of a preexisting religious ethic that encouraged dedication and hard work in the course of proving oneself worthy of salvation. The Protestant Ethic and the Spirit of Capitalism is representative of classical economic sociology in that it uses sociological data on religion to explain the economic phenomenon of northern Europe’s embrace of capitalism. 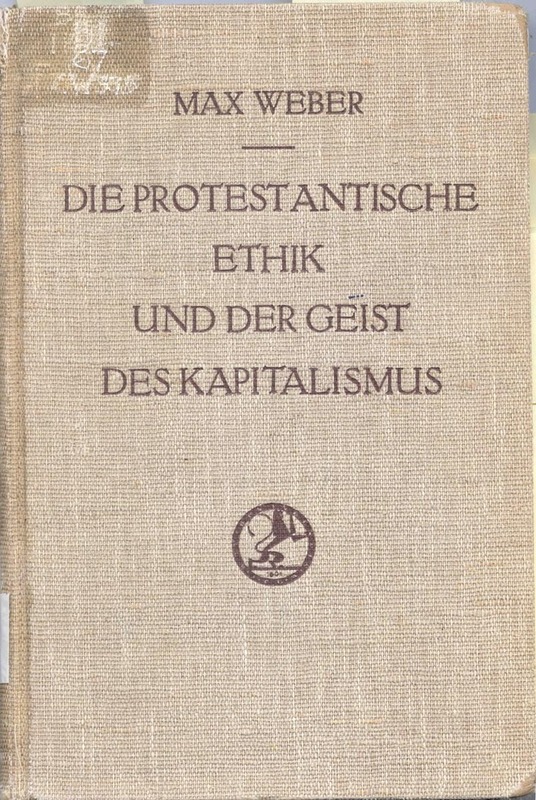 The Protestant Work Ethic and the Spirit of Capitalism: This picture shows the cover to the 1934 edition of Max Weber’s The Protestant Work Ethic and the Spirit of Capitalism. Contemporary economic sociology emphasizes the social consequences of economic exchanges, the social meanings they involve, and the social interactions that they facilitate or obstruct. Influential figures in modern economic sociology include Fred L. Block, James S. Coleman, Mark Granovetter, Harrison White, Paul DiMaggio, Joel M. Podolny, Richard Swedberg, and Viviana Zelizer in the United States, as well as Luc Boltanski, Laurent Thévenot, or Jens Beckert in Europe, among many others. In some cases, contemporary economic sociology borrows mathematical tools and economic theories such as utility maximization and game theory. Some economic sociologists provide a social explanation to questions traditionally addressed by economists. However, other contemporary economic sociologists have forged different research programs based on new questions and new methods.